This is a double-ended Natural Collection eye pencil that I have had since my early-mid teens. I am now 24 (I cannot bear to throw make-up away unless it is seriously gross. If this upsets you, I'm sorry, and don't ever watch Lisa Eldridge's video about her vintage make-up collection. It made me feel vindicated). As you can tell from the amount left, it is not a very good product. It barely shows up on my eyelids. To be fair, my eyelids are brown. But then again, most people in the world have brown eyelids! I am hardly in a minority there, although I may be in a minority of people who are milk-bottle white everywhere else but their eyelids. The darker green is almost entirely useless to me because not only does it not show up very well, what does show up doesn't suit me. When I bought this thing I was still desperately trying to fit myself into one of the colour categories in teenage magazines/this Mary Quant book. They told me that because I had darker brown hair and brown eyes, I was olive (I know). I couldn't be pale because pale people had blue eyes and blonde/light brown hair. So because I didn't fit into either of these categories, I had no idea what colours would suit me. 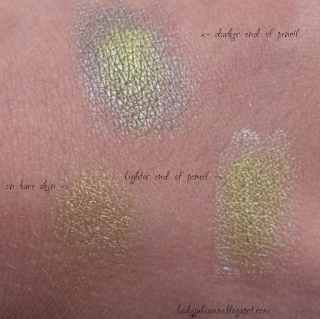 The light green is actually quite pretty and shimmery, if woefully unpigmented, but it doesn't look good on top of light brown and is therefore really only suitable as a highlight. Note: it only looks this scaly because my eyes, hot days, and anything more than Urban Decay Primer Potion as a base do not get on. Because I took the photo right next to a window it looks significantly paler than it did in real life. In reality it was much more chartreuse. I'd already tried packing the Sleek Circus green on top of cream eyeshadow, to little avail, so I wasn't expecting anything like this! I was checking out the gorgeous colour out in mirrors all day (a calmer reaction than running through the streets of Syracuse naked, I'll admit) but it wasn't what I was originally going for. 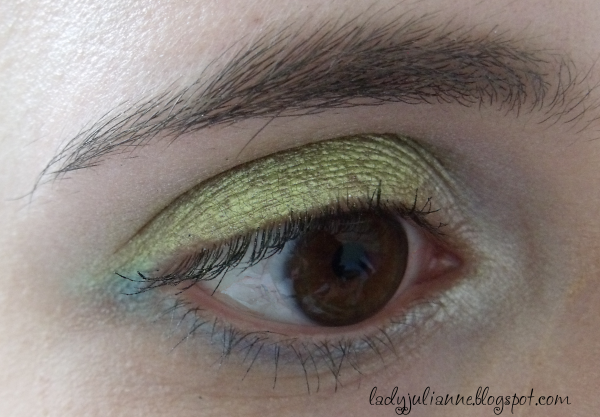 Unfortunately, it doesn't last particularly well in hot weather (it was a very warm day last week), so I'll have to abandon this combo for a few months, but it's good to finally know how to get the Sleek Circus green to look like it does in the pan! Even better, it appears to work with the darker green end of the pencil as well, so I may finally get some use out of that! 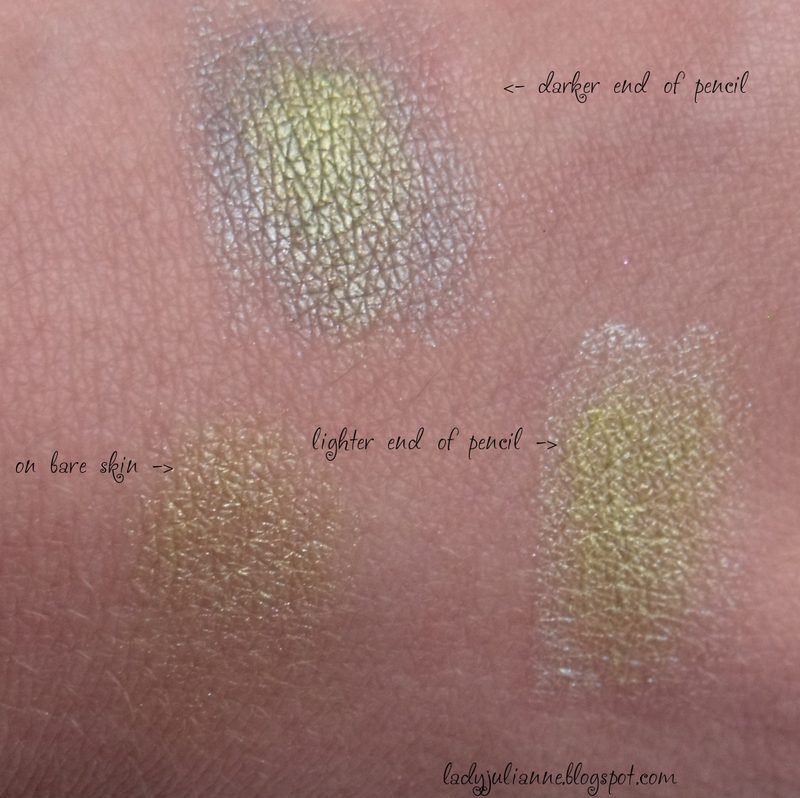 And if I can find a way to make an eyeshadow work, I'm sure everybody else who was disappointed by this colour can too. Moral of the story: swatch your combinations before you put them on your eyelids.